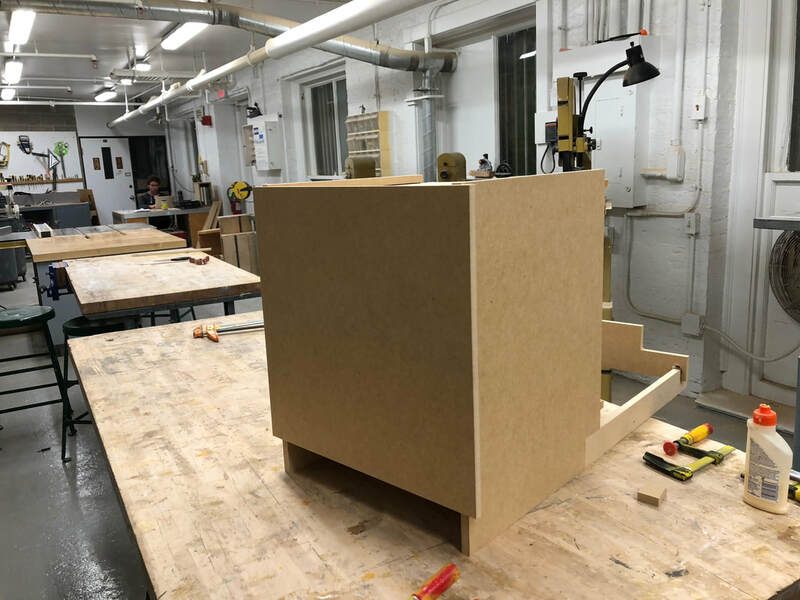 The Construction of the Test box was one of the most important part of the process. 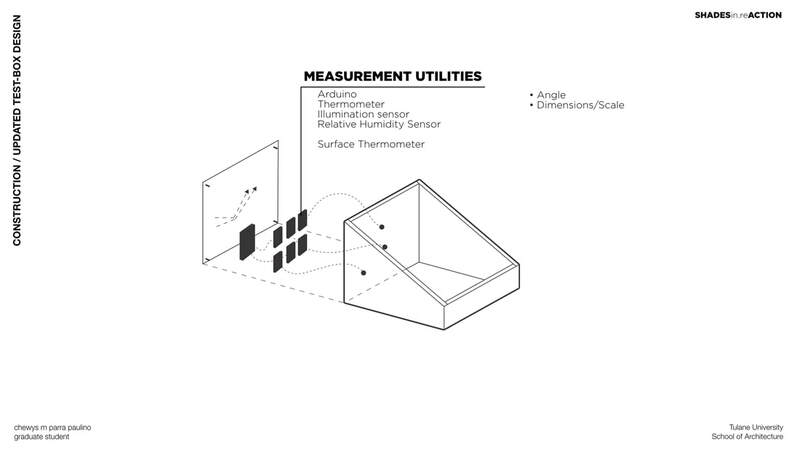 For the design and construction of it, It had to be taken in consideration the Scale, 12" x 12" glass sample, Material thermal capacity, Material thickness, Assembly friendly design, Shading system support, sensors and electronics inlet compatibility, and others. 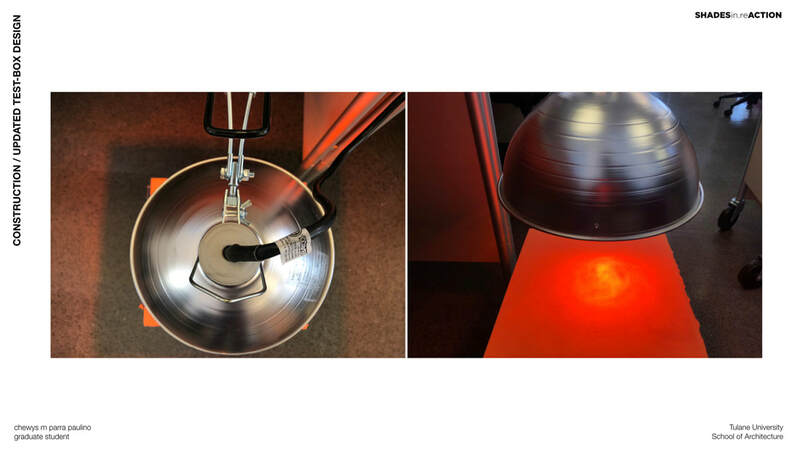 The Test Box elements consists of a 250w Heat Lamp acting as sun. 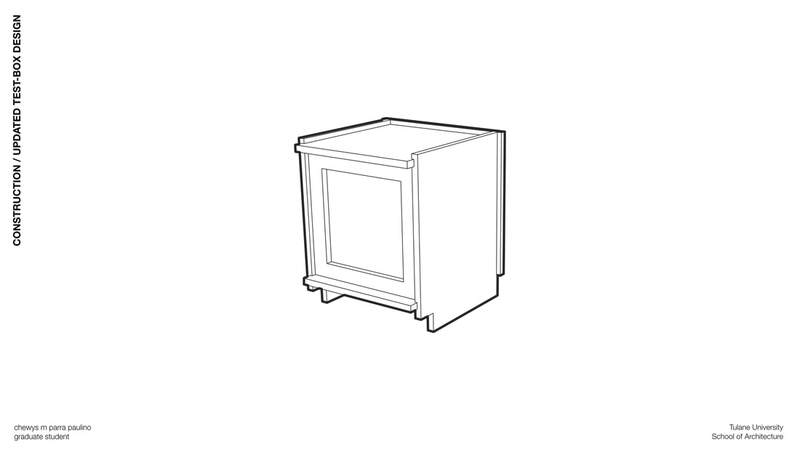 This will directly affect the glass material that divides outside from inside the test box, symbolizing a typical building. MDF (medium density fiberboard) had a good observational result. 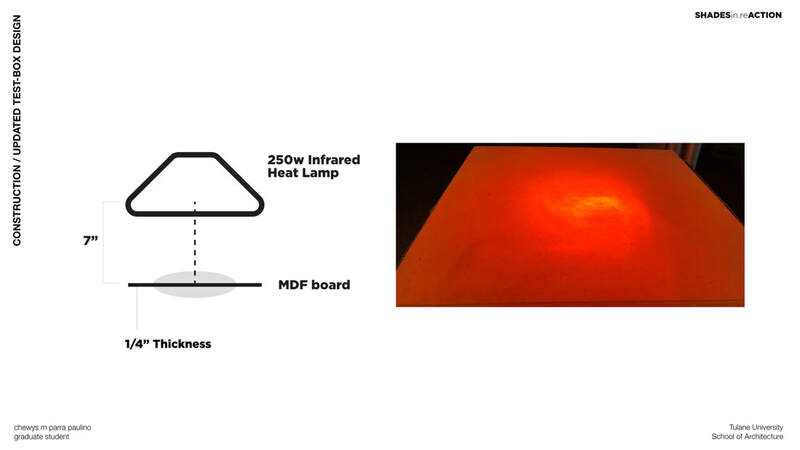 The material was tested by being in constant heat gain from a 250w Infrared Heat Lamp. The test was held for 15min. The MDF board maintained its physical qualities as well as its strength. The material didn't transferred any heat in the opposite face from where the heat was being applied. ​CNC Mill - MDF 1/2" + PVC 1/4"
1st Iteration Test Box key part was its angled surface, where the glass was goin to be placed. 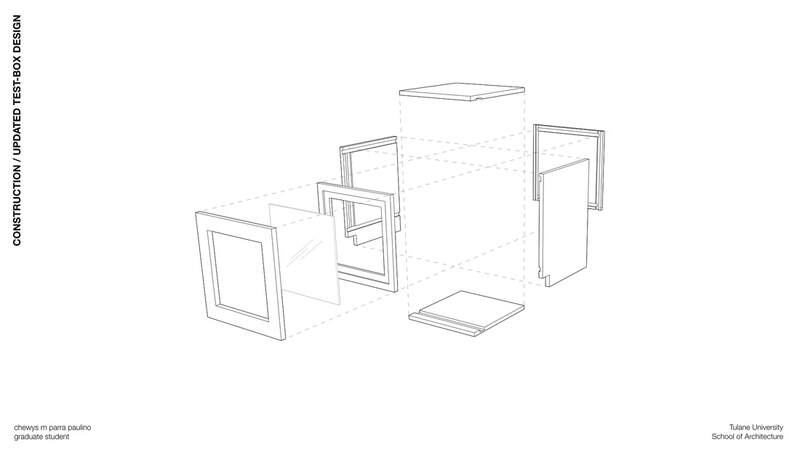 The inicial intension was to us the real sun to hit the glass with natural radiation, therefore the idea was that by having an angle you can get a perpendicular direction that will have an stronger impact inside the test box. 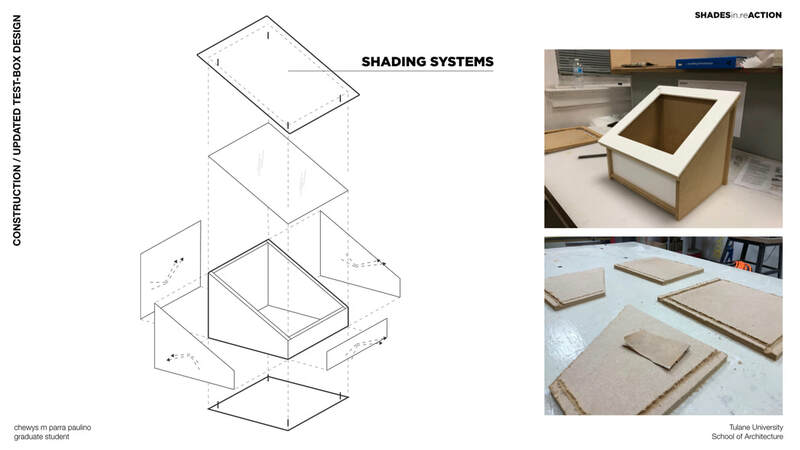 The problems with the construction process where based on the MDF real thickness. 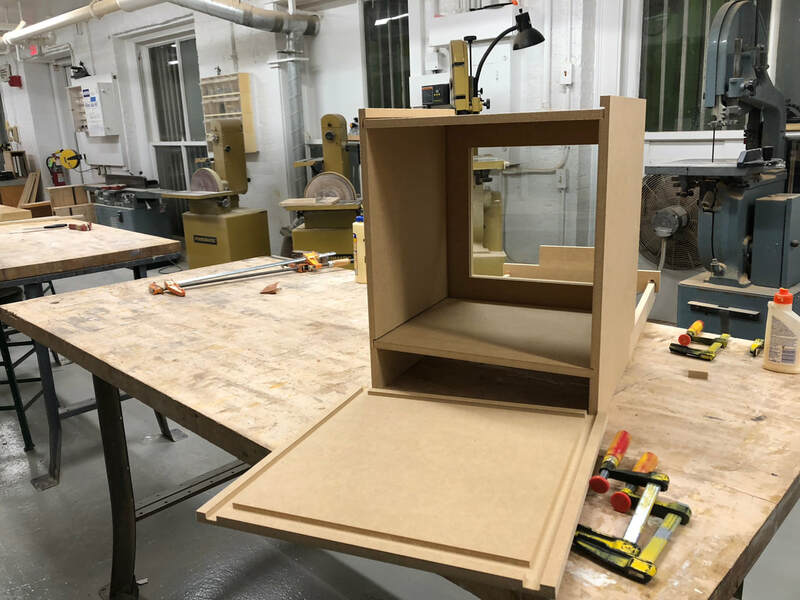 Since the pieces where cut by a CNC router, the precision had to be intact in order to expedite the process and having an accurate assembly process. It is important to measure the real material thickness and to be aware of the depth of edging so the material does not lose its strength. In the 2nd Iteration Test Box the scale is bigger. It was decided to have a vertical glass surface to simulate a building. Consequently, the interior volume is greater then the 1st Iteration Test Box. Also the 2nd Iteration Test Box is significantly separated from the ground to keep the button surface with no contact to where is sited on. This Iteration had a more simple assembly process, and at the same time a more successful one.